Cut up all the fruit and toss into a blender or food processor. I used a blender. Add the can of sparkling orange juice. Blend until smooth. 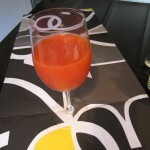 Serve 8 ounces in a white wine glass or any other beverage cup that showcases 8 ounces of liquid. Tips: Since this smoothie is only 91 ounces per serving, consider pairing with something else. I like to have with one half bagel spread with low-fat cream cheese. Or, you can double the serving size of the smoothie.